Perhaps on a trip back East or to the American South, you’ve visited a Civil War battlefield or two. These national parks and pilgrimage sites receive hundreds of thousands of visitors annually. During the decade before the U.S. Civil War, a different conflict made a big impact on the Oregon Territory’s future. It’s known as the Rogue River Indian War. But you’ll be hard pressed to find or tour those battlefields. Now, a series of archaeological investigations is resurrecting this Northwest history. Correspondent Tom Banse went to southern Oregon to find out more. 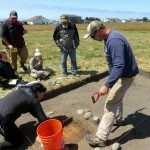 Left: Southern Oregon University archaeology field school participants unearthed the remains of Miner’s Fort in Curry County. The pioneer militia redoubt was besieged near the end of the Rogue River Indian War in 1856.